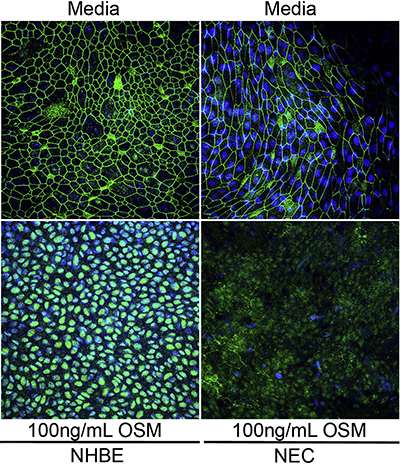 The lattice-like structure of tight junctions (stained green) in the epithelial barrier break down after Oncostatin M exposure (bottom) in bronchial (left) and nasal (right) cultures. Cell nuclei are stained in blue. A new Northwestern Medicine study suggests that a protein called Oncostatin M (OSM) may compromise the airway’s epithelial barrier, a wall of cells that blocks pathogens, environmental factors and allergens from entering tissue and triggering the body’s immune system. The study’s findings, published in the Journal of Allergy and Clinical Immunology, may have implications for patients with mucosal diseases such as allergic asthma, eosinophilic esophagitis and chronic rhinosinusitis, a type of sinus inflammation that persists for 12 weeks or more. Working with senior author Robert Schleimer, PhD, chief of Medicine-Allergy-Immunology, Pothoven first found that levels of OSM were higher in nasal polyp tissues from patients with chronic rhinosinusitis compared to controls. Next, the scientists studied the protein in bronchial and nasal epithelial cell cultures. They treated the cultures with concentrations of OSM similar to those observed in vivo and then measured resistance and permeability of the cell layer. Resistance was measured with an electric voltmeter and permeability by putting large molecules on top of the cells and seeing how many passed through. The scientists also observed increased levels of OSM in patients with asthma and eosinophilic esophagitis, an inflammatory condition in the esophagus. Altogether, the study suggests that this protein may play a role in the mechanism behind epithelial barrier dysfunction and chronic conditions that result from it. The effects of OSM, however, are not necessarily permanent: After it was washed out of cultures, cells were able to recover their barrier function. OSM has many other important functions in the body – it’s involved in bone development and metabolism of the liver for instance – so potential future therapeutics targeting OSM would likely be administered using nasal sprays or inhalers that provide treatment locally rather than systemically. In ongoing research, Pothoven is investigating how OSM is related to inflammation in the lungs and gut in addition to the sinuses. She also wants to find out the specific mechanism that leads to this protein causing the epithelium to lose barrier function. This study was supported by the National Institutes of Health grants R37HL068546, R01HL078860, U19AI106683 and T32AI007476-16 and the Ernest S. Bazley Foundation.